The intro leading up to E major contains an upward progression of whole tones, moving up from C major, to D major, then after an Esus2 chord, to E major. This progression of whole tones, as we read on, is a motif that is consistently used. The Esus2 chord is used for prolonging tension using the F carried on from the D major chord before the song actually starts at 1A in E major. The cellos are used to resolve the F back down to an E. Combined with the percussion instruments, this creates an effect of the song starting undeniably in E major. 1A starts with a perfect cadence in E major – I, IV, V, I, establishing E major as its homeland/initial starting point. The melody in M7 starts out simple, consisting of two notes with one note resolving to the other. It is then repeated right after in M9 a whole tone below, in other words, this is a two-step sequence. 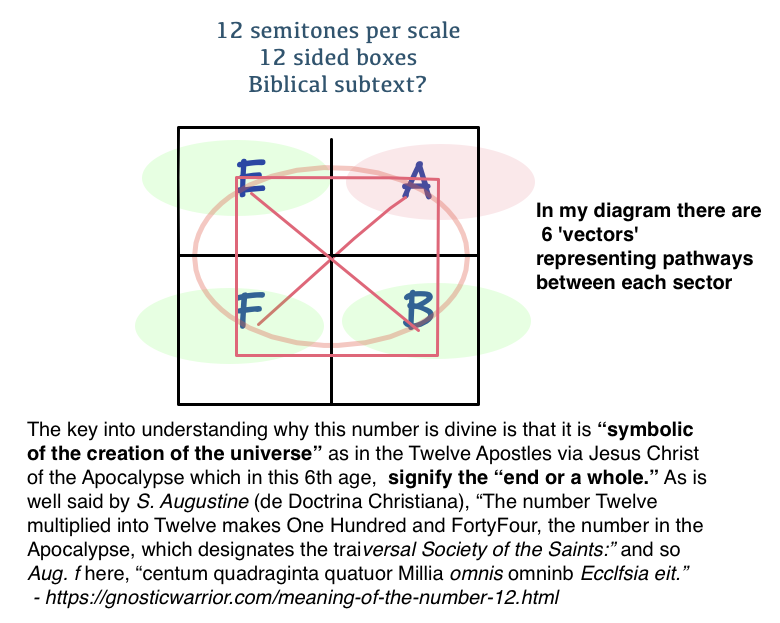 Following that, the melody from M13 to M15 is also restated right after, which introduces what I believe to be an important concept throughout the song – duality. The lyrics portray a sense of two contrasting things – whether it be singing of both happiness and despair, light and dark, silence and the bell, or of course, the characters Kimi (you) and Boku (I) – duality is strongly presented in music too through the use of sequences and repetition. The next section is where things get interesting. 1B starts in E major but quickly modulates, using the circle of fifths, to B major in M25. Now with the key in B major, this process is repeated except that the second time in M29, instead of resolving to B major, we go from the dominant F# chord to a half step above – G major, which has a chromatic mediant relationship with B major. Specifically, it lies a minor sixth above and shares a common tone B with B major. However, despite this chord being used, it resolves back to B major through again, the use of a sequence – G major to D major followed by E minor to B minor. The violin part also depicts this sequence clearly. Now you might wonder, is there a purpose to this surprise chord? Let’s take a look at the lyrics in the next section. 1C starts by modulating from the dominant of B major – the F# major chord – to A flat major. This kind of direct modulation is also used in ‘far on the water’ (in fact the same set of chords from F# major chord to A flat major) and I will attempt to explain this modulation with the help of the lyrics. Below is the lyrics for this section. From here on I will refer you as Kimi and I as Boku. The night in which you cried – I believe this section is telling a story of the past, where Kimi has experienced a failure of some sort. This section also seems to me to be a flashback; thus, it makes sense that it would be told in a different key directly from the start. The story tells of a radiance of Kimi’s future that is being concealed in this night. A radiance that exists and is waiting for Kimi on the dazzling hill that Kimi can surely reach, in other words, Kimi’s horizon, or as I interpret it, Kimi’s fate. What is exactly this fate? If we look at the harmony progressions, we can see that we are moving from A flat major (M37) to the dominant E flat major, and then going a half step above to E major before modulating to B major. This is in fact the same progression Kajiura uses in 1B when the dominant F# major leads to G major, except that in 1B it does not lead to modulation, but here in 1C it does. Therefore, this progression is merely ‘concealed’ in 1B, or perhaps, ‘failed’ by Kimi, but is utilized to the full extent in 1C to reach Kimi’s fate/horizon – which I believe to be the modulation to B major. B major is also the dominant key of E major – the home key of the song – so it is logical that E major’s ‘fate’ is its dominant. Boku seems to me an important character in the lyrics to help Kimi realize Kimi’s fate. With the help of Boku, Kimi can step out of this night of suffering and climb up the dazzling hill where Kimi’s horizon awaits. I think that this duality/contrast between the darkness at night and the dazzling radiance can be represented through the keys of A flat major vs. B major. If we refer to the circle of fifths, the key of A flat major is very far away, if not the furthest, away from B major. Moving from night to day is like moving from a flat-dominated key to a sharp-dominated key. The amount of work to do this is also represented by the hill, a symbol of the efforts required to reach Kimi’s horizon. Considering this song in the context of the anime Fate stay night, I’m also toying with the idea that Boku might represent the Servant, while Kimi might be the Master. Specifically, this might be denoting the relationship between Archer Emiya and Rin, where Archer helps Rin obtain the Holy Grail. But I am not sure about this. At M45 we reach B major and are moving into a cadenza section where we go through a number of interesting chords before arriving at B major, which is established more firmly through the use of multiple cadences. In M47, we first go through an ascending whole-tone progression from B major to D# major, which is a reference to the intro where this progression is used. However, this is quickly resolved through a sequence and we arrive at a perfect cadence in B major in M57. It is also worth noting that up to this point, there hasn’t seem to be a satisfying cadence in B major, so this is the first time we feel like we have reached B major definitely. After that, we go through yet another ascending whole-tone progression from G major to B major before ending this section. I believe that these multiple imitations of this motif from the intro is like an echo – echoing of the bell that Kimi rang at the top of the hill. This is also a reference to the lyrics of the last stanza, where the speaker sings that even if this melody/tune should disappear towards the distant horizon, it should leave an echo. “ring your bell, and raise your song” – raising your song can best be interpreted as singing loudly, with the same purpose of the bell; it is to leave a mark of its existence, like an echo. It also reminds me of the flags used in the mv – a symbol of existence placed firmly into the ground that is later used by Kalafina in the Budokan for the 10th anniversary. For Kalafina, singing in the Budokan, as described by Keiko, has always been a dream. A dream, their fate, or what have you – it is definitely the pinnacle of radiance in their career as Kalafina. However, even if after this radiance of that night, Kalafina one day disappears, or should I say, already had, they would “raise their song” and sing of both happiness and despair at the top of their lungs, so that their echoes that night will always remain in our hearts. It definitely makes sense now why they chose this song as their first song for the anniversary – they wanted to deliver this message of singing to the best of their limits at the very beginning. Sorry that I had gone off on a tangent. Moving on to the D section (as 2A to 2C is basically the same), we have a choir singing from A flat major to E flat major, then goes through F# major back to A flat major. These are keys that we have not yet modulated to before and suggests of the path continuing towards to reach where Kimi is currently at and the path needed to be taken to reach the horizon. Next, we have a recapitulation of the C part, this time as 3C, which leads to the Ending1 in B major. There is yet another Ending2 which reestablishes B major more firmly as the final destination, as the horizon that is reached. Again, the whole-tone progression of G major to A major to B major is used extensively, given a sense of ascending up towards B major. Ending in B major rather than returning back to E major of the beginning is definitely logical considering it in the context of the lyrics. Kimi has arrived at their fate, and being the destination that Kimi is destined to arrive at, going back to either E major or A flat major would be going against the lyrics. Summing up, I believe that at the end, the singer tells of the importance for the listener to move forward towards our fate and that the only thing stopping us from going there is “our heart”. The radiance of the bright future is waiting, and we need to break out of this night in order to see it, and once we reach it, the singer tells the listener to ring their bell and sing out their voice for the world to remember – a beautiful message for a beautiful song. I have downloaded this and I'll get to analyzing it as soon as I can…. hopefully soon, I'm swamped. thanks for doing this when I'm too lazy despite promising myself to do it. It's fine, take your time. It is indeed an interesting piece to analyze and I have definitely not covered all the aspects. My quick at a glance impression of the harmonic outline is how E - A - B seem like bell-echos from one to the other represented by the Dominant progression, its a triumvirate seeing how A <—E —> B are connected like the three singers, passing one 'final message' on to the other like a hand off. I know you can say that A' is incongruent here because B and E are the natural type, but I think it might even be wrong to look at it that way since F minor is kind of the phantom key here. I - ii - IV -V - I is a very common progression (for instance from E major) and considering F minor is the relative minor of A' major, you can say they are technically the same palette anyway, and f minor also being a neopolitan 2nd alteration of the II chord for E major, you can see how YK is kind of using these flat/natural relationships to add drama to her music without drastically altering the harmonic structure. Also keeping in mind that F major being the Dominant of B major, lets say for instance that F Major is implied as a phantom "fourth' key for the A - E - B - relationship with the final 'ring' destinaiton, or fourth party, being the listener of the song - so picture a 4-way chart or square in which these 4 keys lead back into each other in a echo-like way, considering all the ways these 4 keys can influence each other. Maybe the final F major was left out so you could imply that B leads into it next, or rather that E major is the leading chord in a Dominant VII progression leading next into F.
Also the website I referenced mentions the 12 Zodiacal Signs, which is a throwback to the old song we know so well. I wonder if it can be analyzed as such. There are lots of little relations like as you described that we could go on for days. I guess I'm just sad that basically YK has no venue for creating more epic songs like this. One one hand she began in a simpler style but maybe something new will come out of this. Interesting insight, but still a boring song. Really appreciate the effort for making the analysis though. Am actually listening to the song again after maybe 3 years not listening to it and paying attention to the points mentioned. I didn't even listen to the song before writing that, yea it is kinda boring at this point. Here's my take on RYB, I've analyzed it a ton. I haven't really looked at the lyrical part of it though, so this is pretty much purely theory. The song starts with a bVI-bVII-I progression in E, with that bVI chord also being a Maj7 (CMaj7). It then sits on that E chord for a while, with a quick B/D# before they come in. The pre-chorus (when Wakana comes in) is still in E major, but has a lot of lydian stuff in it, with that #4, hence why all the A# notes and F# chords. Later when Wakana starts "yume wo mite", it resolves chromatically F# to G (II-bIII), and begins borrowing chords/notes from E min (I would still have the key sig be E Maj though, with accidentals). Going into the chorus, it has the F# jumping up a whole step to an Ab chord, also resulting in a key change to Ab. That F# to Ab jump also comes from the previously mentioned bVI-bVII-I cadence I mentioned earlier, just without that bVI chord (One Light also uses this going into its chorus). However, this bright resolution suddenly becomes a bit fearful with the chords suddenly jumping to a III7 chord followed by a vi chord (C7-Fm). It then goes down to the V chord, which then goes up chromatically to the bVI chord, and then follows the bVI-bVII-I cadence, however instead of going to the Ab chord, it then has a perfect cadence into B major (Eb-E-Gb-B). I will agree this point is the most resolved-feeling cadence we've had in the song to this point. I'm gonna skip all the way to the bridge kajiurago section. It has that F# chord resolving (and changing keys) into Ab again, like with going into the chorus. It then continues going along until that sudden II chord there, bringing in that lydian sound from the pre-chorus again with the #4 (D). It then smoothly goes to the V chord due to the dominant-tonic relationship between the II and V chords (Bb & Eb). It then pretty much follows the chords down diatonically to a C7 (III7) chord when Keiko comes in and sits there for a while, eventually resolving to that tonic Fm chord. It then adds the 7 before jumping to that lydian II chord (Bb), and then somehow smoothly connects to the chord a tritone away, with that bVI (E) chord, and then does a very slow bVI-bVII-I progression, adding that sus4 on the I right at the end to lengthen the progression even more (E-Gb-Absus4-Ab). Finally, the end of the song pretty much abuses that bVI-bVII-I progression, adding a lot of excitement to the song. That progression makes sense here though, as one of my favorite music theory channels, 8bit music theory, has dubbed it the "level clear" cadence, since it's often used as an exciting victory theme.